It’s been a busy week hasn’t it? The budget revealed further cuts in the offing for disabled people – although Nicky Morgan said later they were just a “suggestion”, which was interesting. I’m not going to go into much detail today, as this post is about something else. However, the biggest concerns I’ve heard online centre around turning all England’s mainstream schools into Academies. As we all know from speaking to other parents, many Academies aren’t overly keen on admitting children with SEND, despite it being a statutory duty. The White Paper also leaves the high needs funding and assessment arrangements still in local authority hands, but says, “We are also looking carefully at the assessment of pupils with special educational needs to ensure it helps teachers to support their progress effectively.” [6.21] What could that mean? Finally, for now, at [6.69]. it talks of an intention to, “review what is happening in practice for all children with SEND, not only those with statutory plans, and what more can be done to improve these children’s attainment, outcomes and experiences.” I predict that we will be hearing more on this pretty soon. 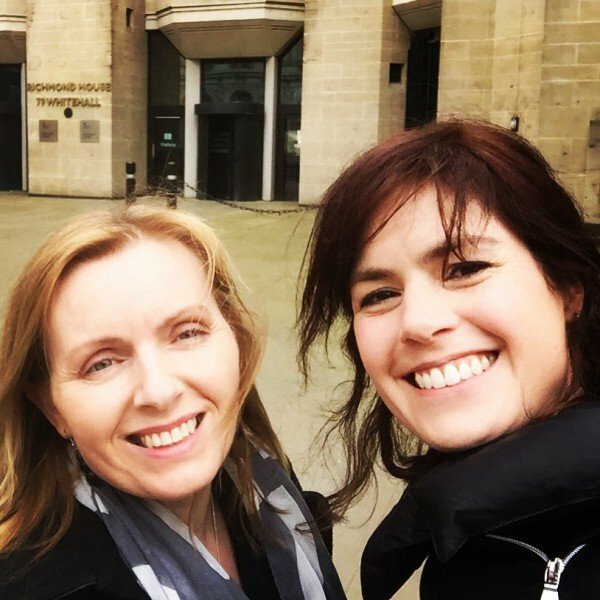 Fuelled by nothing stronger than coffee or tea and toast, we headed next door to the Department of Health for an introductory meeting with the Minister responsible for children’s health, Jane Ellison. Very pleasingly, also in attendance was Michelle Mello, the Deputy Director of Nursing at NHS England (which is where children sit), and Sarah Elliot, the lead nurse for the NHS. And I’m not finished. To show how important parent involvement is seen in central government, also there was Flora Goldhill, the Director of Children and Families at the Department for Health and Ann Gross, Director of SEND at the Department for Education. Both were at our previous DfE meeting. Finally, there was Gareth James who has responsibility the Disabled and Ill Child Services Team at the DoH. An impressive line-up, you will agree! 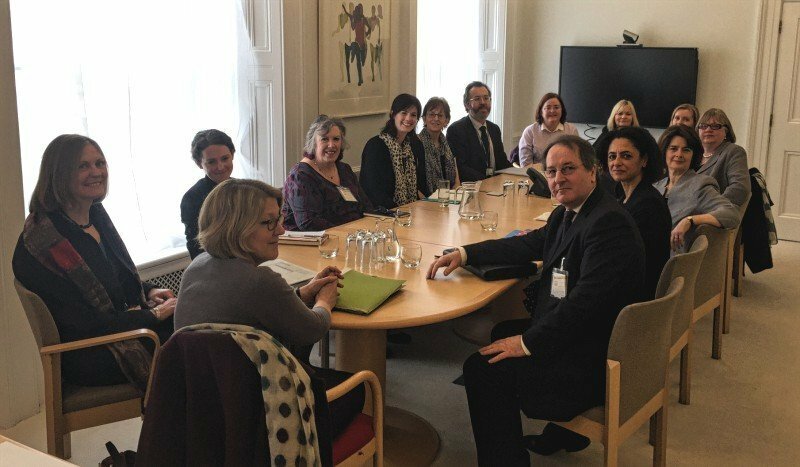 We were there to raise the issues that we have all faced since the introduction of the SEND reforms – the difficulties faced when trying to coordinate and engage with people from health when trying to put together an Education, Health and Care plan. It’s a pretty vital piece of the jigsaw if your child has health needs, particularly as many health needs can impact negatively on children’s access to education and their ability to learn. This needs to change-fast, so this is why we hoped our meeting was just one of a series to turn the talk into real, visible action for parents, carers and children. One of the problems highlighted was that health staff don’t understand their roles and statutory responsibilities when it comes to EHCPs. It isn’t that they don’t want to do the right thing, but if you don’t know what that is, you have little chance of success. Each health area, called a Clinical Commissioning Group (CCG) is supposed to have a Designated Medical Officer (DMO) to liaise with the local authority when organising provision. The DMO is not a post in itself – it is an ‘addon’ responsibility for an already busy health professional such as a paediatrician or similar. You can already see the difficulties, can’t you? Another area of concern is school nurses and their knowledge and confidence for completing or administering EHCPs. Sherann Hillman of the NNPCF said she had led training for school nurses and that training in EHCPs was vital for everyone involved with them. And you would think that this is pretty obvious thing to do when bringing in a new system, but it just hasn’t happened – and that isn’t just for school nurses but across the piece in health, social care and in some parts of education too. Some of the parents reported that they had seen successful joint-commissioning – where local NHS and local authorities work together to provide what a child needs. We need to identify the good practice that is out there and learn from it. It’s time for health, education and social care to truly put the child and family at the centre – fine words need committed action and a culture of not being bound by how things have been done in the past. We heard very positive words in this from Mrs Ellison and from all the health leaders and officials. The Minister said she certainly understood the issues from her own constituents. We hope that this initial 'getting to know you' meeting will be followed by other gatherings, workshops and most of all by a change for the better in health provision for disabled children and their families. What would you like to see work better or changed? Leave your answer below in the comments! Is Peer Support a replacement for professional mental health support? The focus re health in this post and with the health commissioners I’ve talked to locally is on EHCPs. What about children and young people with SEND who don’t have EHCPs? As far as I can tell, there’s often no one in the health service who has an overview of the health issues of young people with SEND. I’m a parent in the process of trying, along with my child’s school, to get a statutory assessment for EHCP for my child. I’m a nurse working as part of the school health team in East Sussex, commissioned by East Sussex County Council. In regard to the observations in the article of school nurses being unsure of their remit …for example, the service specification the East Sussex team work under doesn’t stipulate involvement in EHCP’S in the way the article relates.. It’s not something the service is commissioned to have input with within the 3 CCGs in East Sussex. I’m not sure about other areas, which may be completely different. There is no training offered around it. If it’s not in the commissioned service specification, then there is not a chance of that service having a role in it unless it goes out to tender again… .and is specified in the tender. I’m sure it must be different in different places and I will check what I wrote – it’s quite possible I may have unintentionally overstated -(was rushing when I wrote it) but I will check the CoP on this. There is a CoP guide for health professionals available already and I k ow school nurses are expected to play an important role. No problem at all, I’m sure it is different in different places. In East Sussex, when the school nursing service was under the primary care trust, there was much more scope for school nurses to just dip in and out of everything where the need was. It is much more structured now, and if it’s not commissioned it’s not done. Perhaps commissioners need to take note and see if this is something they would like to commission for the school nursing service to provide and include in a future service specification.